Loyola University New Orleans joins the city in a celebration of art with Loyola in Linen, an alumni reception following White Linen Night, a popular public art stroll through New Orleans’ Warehouse District happening Saturday, August 6. Alumni and friends are invited to cool off from the art walk at the Loyola after-party, which is taking place in the Renaissance Arts Hotel at 700 Tchoupitoulas Street from 8 – 10 p.m. The Loyola in Linen event will be held in the hotel’s Atrium Sculpture Garden. Special university guest, Donald Boomgaarden, dean of the College of Music and Fine Arts, will offer a brief presentation about the college. Admission is $25 per person and includes samplings of New Orleans-style appetizers, unlimited white beverages including white wine, white cranberry juice and sparkling water, and live entertainment provided by Loyola musicians. A cash bar will also be available for those who prefer beer and other cocktails. 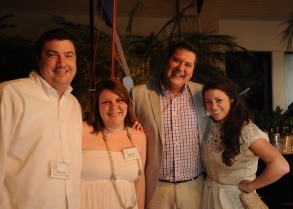 To RSVP, visit the Loyola alumni web site at http://alumni.loyno.edu/linen11. Payment will also be accepted at the door.